‘You must be up early to see the arrival,’ a friend advised. So I was. In the rays of dawn we glided along the glassy water of the fjord-like entry to the small mediaeval, walled city of Kotor lying at the foot of steep and rocky mountains of Montenegro. In the peace of early morning it was hard to believe, except for the abundance of recently built houses, this area had been buffeted for centuries by a tangled web of wars. 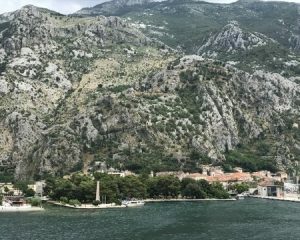 Montenegro has been a principality, a kingdom, occupied by the Nazis, and a part of the Socialist Republic of Yugoslavia, only gaining independence in 2006 after the Balkan Wars that once occupied reams of newsprint. 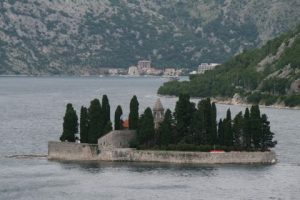 Islets of trees and old churches dotted our watery route to the ancient stoned fortress city. Kotor is not the country’s capital yet to the outside world is probably better known because of its rugged beauty, UNESCO Heritage, and its high population of cats said to be descended from those that jumped ship from trading boats plying the Adriatic during the era of Venetian seafaring and trading dominance. 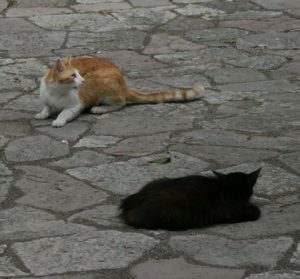 We came across cats hissing and spitting to defend their small territories on warm flagstones, basking in the sun, or hanging about the entrance to the Cat Museum where they knew food was a certainty. In fact the small entry fee to the museum is for that purpose. 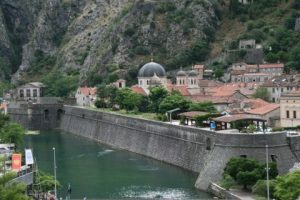 Somehow, amongst all the conflicts and even a damaging earthquake some 40 years ago, Kotor’s ancient walls, churches and fortresses have survived with restoration help from UNESCO. 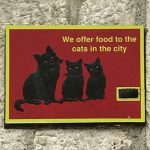 The small city is a jewel on the Adriatic coast, although now sadly at risk – which I hadn’t appreciated until going there – of being swamped by visitors. What a fascinating post about the cats of Koto. I don’t know much about this area but now I am going to do some research. Thanks for the post.